No matter the occasion, our Sweet Celebration hamper is ready to help your extra-special recipient feel like the center of the universe! 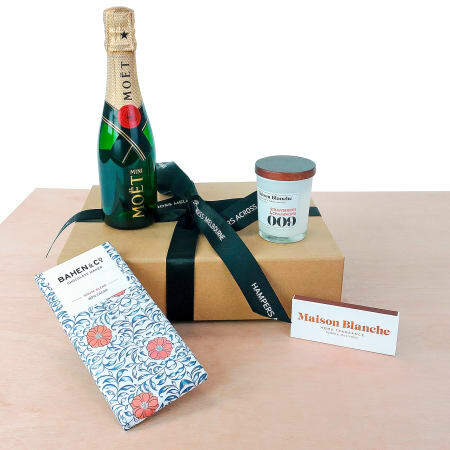 It features a party-ready mini bottle of Moët bubbly to get the festivities going, a mood-setting Maison Blanche 15-hour soy candle featuring a sea salt and thyme fragrance, and a decadent bar of House Blend artisan chocolate from Bahen & Co. – so yummy! Sourced from a volcanic valley on the wild isles of Papua New Guinea. Special organic chocolate to enjoy all to yourself. - Your website was good; appealing to look through and easy to navigate. - Was very happy with the prompt delivery - ordered before midday and it was delivered later that day. - Loved receiving confirmation that the delivery had happened. Didn't know that was going to happen and was wondering if it had been delivered; so was very happy to get the text.